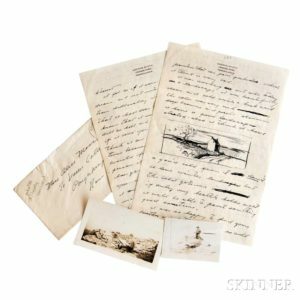 Andrew Wyeth’s Unpublished Love Letters Offered at Skinner in May | Skinner Inc.
An extensive archive of letters previously unknown to scholars and collectors concerning one of the most secretive and celebrated American artists of the 20th century will be offered in Skinner’s May Fine Books & Manuscripts online auction. The 43 letters were sent to Vassar College graduate, Alice Moore, the daughter of a Baptist minister in Poughkeepsie, between August 1937 and March 1939. They provide a rare insight into the private world of a young Andrew Wyeth, whose cosseted upbringing had kept the twenty-year-old sheltered from much of the outside world. 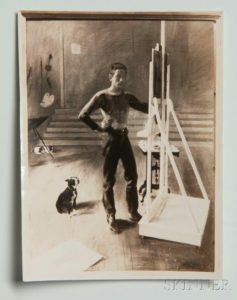 The youngest child in an art-loving family, Wyeth did not attend school, receiving art and cultural instruction at home from his father, the artist and illustrator N.C. Wyeth. These letters record many details of Wyeth’s earliest romantic relationship, which lasted for approximately two years. The period coincides with Wyeth’s emergence as a prominent force in the art world, while he was between the ages of 20 and 22. They begin a few months before his first show at the Macbeth Gallery in New York (October 19-November 1, 1937) and end at about the time Homer Saint-Gaudens extended an invitation to Wyeth to exhibit one of his tempera panels at the 1939 Carnegie International exhibition of contemporary art in Pittsburgh. At the time, Wyeth was the youngest artist ever invited to exhibit. The love affair is characterized in the letters by Wyeth’s great yearning for Moore’s companionship and his strong desire to marry her. He seems most preoccupied with proving that he can make a success of himself as an artist so that he can ask for her hand. The extent of the content (approximately 13,000 words), the intimate nature of the communication between these two parties, and the relatively sparse information on the artist from this period combine to make this archive a substantial resource. Almost every letter is accompanied by its original envelope, included with some letters are press clippings, show catalogs, small black-and-white reproductions of some of Wyeth’s work from print media, and a snapshot of Wyeth, with many items inscribed in Wyeth’s hand. 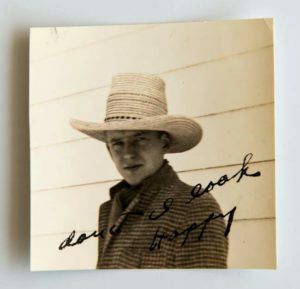 The basic information one gleans from the letters is at odds with Wyeth’s biographical record. In Richard Meryman’s Andrew Wyeth, a Secret Life, Alice Moore makes a brief if altered appearance. She is described as ten years older than a seventeen-year-old Wyeth, whereas she was a 1935 college graduate, making her only three or four years older. The relationship was said to have been kept a secret from N.C. Wyeth, although Moore clearly visited with the family in Chadds Ford on several occasions. 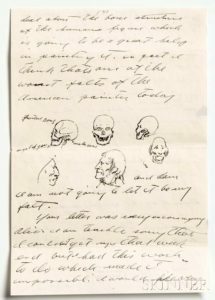 In further support, the archive also includes two letters addressed to Moore from Wyeth’s mother, and two others from his sister Carolyn. Finally, Meryman states that Wyeth broke off the relationship with Moore when she suggested marriage, which, based on Wyeth’s own words in dozens of letters, is patently untrue. The last letter to Moore is dated March 24, 1939, and gives no indication of an impending break-up. The relationship ended, although by which party we may never know. Wyeth met seventeen-year-old Betsy James on July 12, 1939, and married her less than a year later, on May 15, 1940. Because the complete range of content cannot be easily described in this space, transcriptions of the complete archive will be made available to any interested parties. The online-only auction will open for bidding on Tuesday, May 23 at 12PM with lots beginning to close on Friday, June 2 at 10AM. Public auction previews will be held in Skinner’s Marlborough, MA Gallery on Tuesday, May 30 from 12-5PM and on Wednesday, May 31 from 10AM-6PM. This entry was posted in Blog and tagged Andrew Wyeth, Carnegie International exhibition, fine art, maine, marlborough, N.C. Wyeth, paint, painter, painting, skinner, skinner auctions by Devon Eastland. Bookmark the permalink.